In 2011, cancer care was identified as an emerging role in occupational therapy. Occupational therapists help cancer patients address falls, cognitive function impairment, cancer-related fatigue, upper extremity impairments, lymphedema, chemotherapy induced peripheral neuropathy, and functional impairments. One treatment modality to address several of these areas is Pilates. Naomi Aaronson MA OTR/L CHT was drawn to cancer care early in her career. She was then drawn to Pilates as a treatment modality after personally experiencing the benefits of it. Below is her story along with resources for OT practitioners who are interested in this practice area. Can you briefly describe your professional journey leading up to your involvement with OT and oncology? I was first introduced to breast cancer patients when I worked in an outpatient hand and upper extremity department at a city hospital. Lymphedema patients and breast cancer patients were getting referred to us. I had to quickly get educated as to the do’s and don’ts, as cancer rehabilitation wasn't a traditional practice area in the 1990’s for OTs. I fell in love with it since it required multiple skill sets including psychosocial practice. Now CDT is an evidence-based approach used for lymphedema and cancer rehabilitation is an emerging OT practice area. There are multiple studies where occupational therapists have been involved with cancer rehabilitation for lymphedema, fatigue, and chemotherapy-induced Peripheral Neuropathy. What drew you to Pilates as a treatment modality for cancer patients? In 2008, I was injured in a car accident. I ended up with herniated discs in my neck, limited neck mobility and a shoulder impingement. I was offered different treatment modalities including Pilates and Feldencrais after I progressed in PT. I did not know how to use my shoulder and neck correctly without compensating to perform functional tasks like driving due to pain and limited range of motion. In addition, I wasn't breathing and using my scapula efficiently. This in turn affected my posture and my trunk movement. Pilates helped me to regain and integrate body awareness, proprioception, and natural body movement without compensations. I thought how wonderful it would be to use Pilates with breast cancer survivors who have to deal with scar, limited range of motion, lymphedema, or axillary web syndrome. These can be quite common conditions after surgery and lymph node removal. I started using what I was doing in rehabilitation, and then went on to receive training in Pilates and different breast cancer rehabilitative approaches. Tell us about your business, Recovercises, and current ventures. I am now retired, but previously treated breast cancer patients and hand therapy patients at Recovercises. My passion is focusing more on prevention and wellness for women through a combination of Pilates and occupational therapy. My other new venture is teaching occupational therapy to OTAs at a community college. 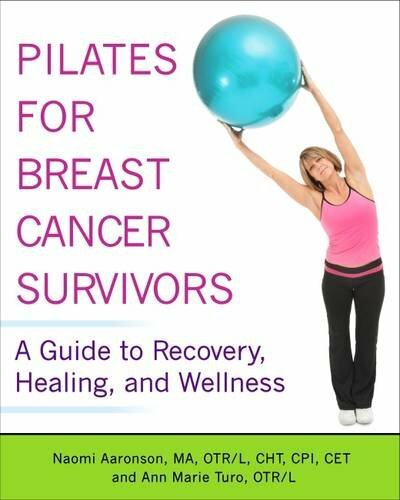 Also, another occupational therapist and I teamed up recently to write a book entitled Pilates for Breast Cancer Survivors: A Guide for Recovery, Healing, and Wellness. We use seated, mat, and standing Pilates exercises with exercise goals, descriptions, and photos. This book would be beneficial for other special populations as well, since we emphasize functional goals such as dressing for each exercise. Pilates can be beneficial for many of the populations that we work with including those with Parkinson’s disease and MS, and can always be modified for each individual. How has your background as an OT informed your work as a Pilates Instructor? Actually, I feel that Pilates has informed my work as an OT and changed my ideas of rehabilitation around. Joseph Pilates started out with his method as rehabilitation for injured soldiers during WW I. I focus on correct rib cage breathing, proper alignment, and posture before doing therapy. If you don’t start out correctly, how can the exercise or task be ideally performed? Joseph Pilates had his principles, which are used with every movement. These include concentration, core control, whole body movement, rib cage breathing, flexibility and stabilizing before moving. Patients are so stressed when they start rehab, that I needed to find a way to meet them where they are. My skills as an OT give me more credibility and the necessary clinical judgment, psychological awareness, anatomical and biomechanical skills necessary to focusing on working with this population. Are your sessions reimbursed as occupational therapy or a this a new venture entirely? Pilates can be considered either therapeutic exercise or neuro-muscular re-education just like many of the other exercises that we provide to patients when they are being billed in OT. However, it has to be medically appropriate to the diagnosis. What resources/research have been most influential in your work? Pilates research is in its infancy. Despite that, there are 5 studies, which cite the benefits, safety and effectiveness of Pilates for breast cancer survivors. There is a beautiful Pilates system called Fletcher Pilates, which teaches clients how to use a braided towel to learn how to stabilize and activate the scapula while performing weight bearing movement. Joseph Pilates developed many machines such as the Reformer and Cadillac. The Reformer is an excellent tool to teach clients how to learn how to activate the core and learn stabilization of the lumbo- pelvic region while performing upper body movement. One can work in supine, prone, high kneeling or seated making it easily modifiable for each patient’s needs. What are your greatest challenges as a practitioner on a day-to-day basis? The medical community still does not understand how Occupational Therapy can help cancer survivors. We can address fatigue, chemo-brain, Peripheral Neuropathy, and Lymphedema in a purposeful and functional manner. If another OT was interested in OT and Pilates how would you recommend they learn more? I believe that undergoing a Pilates’ certification is necessary to really understand the Pilates exercises. There are more than 500 exercises in his system! One needs to feel, practice, and teach Pilates to gain the integral verbal, teaching, and tactile cues that can help our clients recover. There are now a few organizations that specifically address Pilates as a rehabilitative method. For example, the Stott Pilates Rehab Instructor Certification and Polestar Pilates. Alpozgen AZ, Ozdincler AR, Karanlik H, Agaoglu FY, Narin A. Effectiveness of Pilates-based exercises on upper extremity disorders related with breast cancer treatment. Eur J Cancer Care European Journal of Cancer Care. 2016. Keays KS, Harris SR, Lucyshyn JM, Macintyre DL. Effects of Pilates Exercises on Shoulder Range of Motion, Pain, Mood, and Upper-Extremity Function in Women Living With Breast Cancer: A Pilot Study. Physical Therapy. 2008;88(4):494-510. Pergolotti M, Williams GR, Campbell C, Munoz LA, Muss HB. Occupational Therapy for Adults With Cancer: Why It Matters. The Oncologist. 2016;21(3):314-319.